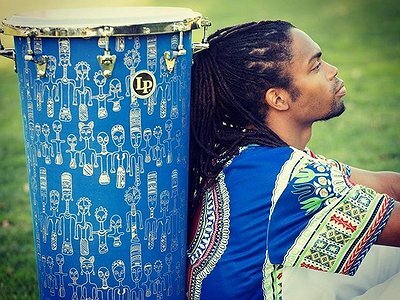 Upcoming Event: Kahlil Cummings is co- music director of the Afro Brazilian dance organization Viver Brasil. He is co-creating new musical soundscapes – which he will perform live – for Viver Brasil Celebrates 20 Years: Agô Ayó — Spirits Rising, which premieres at Los Angeles’ Ford Theatres on Friday, September 22, 2017. Musical Recommendations: I recommend “The Prophet by author poet Kahlil Gibran. A classic work that has so many lessons. He has constantly inspired me and my art. I also recommend a song by Bob Marley: “Revolution”. Here’s a line from the song that I think speaks volumes to the times, and reflects a deep truth, that I feel we all can look to. “Revelation reveals the truth - revelation. Never make a politician grant you a favour; They will always want to control you forever." Website / Contact: If you enjoyed this interview with Kahlil Cummings, visit his web page for plenty of information and music. My father was a musician/ percussionist. He would take me everywhere with him; Shows and classes included. So I grew up listening to African, Afro Cuban, Afro Brazilian percussion as far back as I can remember. I began playing super young. Honestly my earliest memories of drumming are on sparkling water bottles, pots, and pans; recreating the sounds I heard at classes. I remember my father walking in the room surprised because I was the quiet type at classes and shows, just watching and listening to the music, while all the other kids ran around and played. But when I got home, I would drum up a storm. I received my first official drum (Djembe) at 7 years old. It was the greatest gift ever in my life. I strongly feel that I was born to drum, and I feel that the Djembe opened the door to all the other percussion instruments, in the African Diaspora. It’s something I know is a part of me. There is an Africa proverb that says “Out of the djembe was birthed ‘Sewa’”, which means “Joy.” And that joy and happiness is medicine. I find this to be absolutely true in my life. Music and drums are my medicine, and also a healing tool that I can use to heal others. I feel that when it comes to my craft, that I am a geek about learning. I feel that I will always be a student, and that the journey is a life-long process. That the plateau is never fully reached, but constantly evolving from learning and relearning. I believe this begins with first acknowledging your elders, and teachers. Especially in your work. And developing lasting relationships with them as well. That being said, I have quite a few elders/teachers with whom I have spent many years honing my skills. And the beautiful thing as a student is a reflection of the teacher, so in a lot of ways these teachers take pride in my success. And they rightfully hold me responsible in preserving and carrying on their legacy, information and teachings. As I matured this helped me find my voice and identity in the music. Of course there are certain artist that influence me deeply. One example, Mamady Keita re-known African percussionist being one of them. I grew up listening to his recordings, and would memorize every note on entire albums. When I was 10 years old I had the honor to take a class from him, and since then I’ve developed a beautiful lasting relationship, and continue to work with him today. I believe also that respecting your elders is vitally important, in your growth as well. There are a few quotes that come to mind but one that I love is “We are all apprentices in a craft where no one ever becomes a master.” So, to me, recreating and being inspired by those influences is art. In that I find myself always acknowledging their footsteps, inspired and shaping my own path. Resting on my shoulders are the hands of great teachers. This gives me the support and strength to fearlessly create art. I was definitely blessed to be able to perform on stage at a very young age. I often would be the only child in the room at rehearsals with my father, but I would hang with the adults. I would even co-teach with my father at his workshops. So as a result, growing up even though I was lucky to be in position to teach, and lead music at a young age, it was hard to gain the respect of adults who especially considered themselves masters. One of my elders once told me, “because you are young, and talented, others older especially will be jealous of you, but stay humble, focused, and share with your generation as much as you can“. Over the years, as I continue to grow as an artist and musician, remaining humble was the best thing that I ever did. When you have nothing to prove, but instead allow your character to speak first, then so many doors will open for you. I truly feel this way. I love to share and teach, and it feels great to have beautiful students, who continue to support my work consistently. For me, I need the studio to be like a shrine. I like the space to be spiritual sort of. As music is spiritual. I often set up candles, and burn sage to cleans the space. I also feel that this keeps the energy pure, and helps to invite creativity. I consider myself a percussionist virtuoso. That being said I’ve spent my life studying, and continue to research musics of the african diaspora. In that I have connected with several percussion instruments. But the drum that I truly believe I was called on this earth to play, is the Djembe. I feel that this drum opens the door to all the other percussion instruments/traditions for me. Today the Djembe is one of the most popular drums on the planet. But it has such a deep, and rich history. It’s an instrument of communication. It transmits vibrations that have the power to heal, and directly carries the voice of our Ancestors. I mentioned the Malinke quote “From out of the Djembe was birthed (Sewa) Joy.” And that is the medicine that heals villages and communities. I love this instrument because it brings an energy that connects me with the divine. I take pride in beautifying them. Because I believe people should see the beauty in not only the sound but the image and the vessel that this magical instruments has as well. I sleep with them near my bed. I even play them in my dreams. This connects me with it so much to the point where I feel absolutely myself while performing or simply playing it. There is not a day that goes by that I don’t touch an instrument. For that I am truly thankful. My schedule varies from classes I teach either at schools though a few different outreach programs/organizations. Also weekly open community drum and Capoeira classes a few times a week. I perform very often, so lots of rehearsals and practices for those shows. I also am accompanist musician for lots of dance classes as well. This keeps a constant flow in my life, and I am constantly touching and creating, sharing my art. "Resting on my shoulders are the hands of great teachers. This gives me the support and strength to fearlessly create art."